The Ellipse Tool allows one to draw ellipses, circles, and arcs. Select the tool by clicking on the icon (F5 or e) in the Tool Box. To draw an ellipse or arc, use a Left Mouse Drag. An ellipse will be drawn with the sides touching a rectangular box defined by the starting and stopping points of the drag. To force a circle to be drawn, hold down the Ctrl while dragging the mouse. This also allows ellipses with a height to width or width to height ratio that is either an integer or in the “Golden Ratio” to be drawn. Holding the Shift key down while dragging will create an ellipse centered around the starting point. Holding down the Alt key while dragging will create an ellipse with the circumference passing through the start and end points of the drag. Using Alt+Ctrl while dragging will create a circle with a diameter defined by the distance between the start and stop point of the drag. To change the size of the ellipse, drag the handle at the top or left. The Ctrl key can be used to force the ellipse to be a circle. 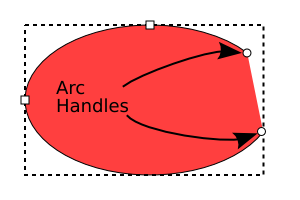 To convert an ellipse into an arc, use the two Arc handles. Initially both handles are on top of each other. Drag one handle to set one end of the arc, then drag the second handle to set the other end. Holding down the Ctrl key while dragging an Arc handle will force the angle of the arc to begin or end at a multiple of the Rotation snap angle (15° by default). If an Arc handle is dragged with the pointer outside the curve of the virtual ellipse, the arc will be defined with a closed path that has a wedge that extends to the center of curvature (as shown above). 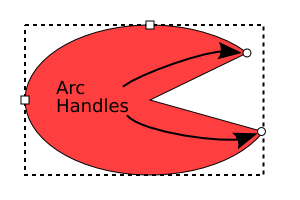 If the Arc handle is dragged with the pointer inside the curve, the path defining the arc will start and stop at the two Arc handles, as shown below. 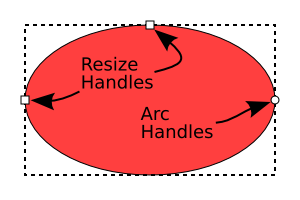 An arc can also be defined using the settings in the Tool Controls when the Ellipse Tool is selected. The settings will affect any ellipse or arc that is selected as well as any that are drawn afterward. The Start and End angles are defined in degrees and are measured in the clockwise direction starting at the x-axis. There are two buttons that toggle arcs between opened ( ) and closed ( ) (switchable if either angle is not zero). There is also a button to reset an arc to an ellipse ( ).